We’re completing our review of the luxurious Waldorf Astoria Ras Al Khaimah with a look at a few of the restaurants and the spa (oh, the spa!!). 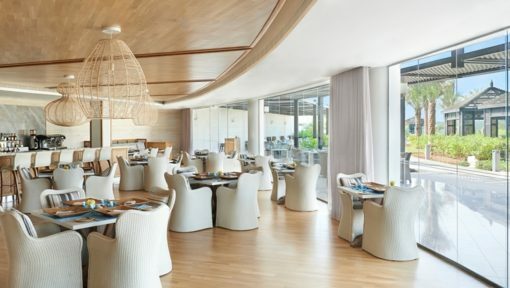 There are an array of restaurants, bars, and lounges at the Waldorf Astoria Ras al Khaimah, all run under the watchful eye of Executive Chef Rudolf Segers. Having been with the hotel since its opening in 2013 (as have quite a few other staff members I met during my stay – a good sign! ), Chef Segers runs his teams like well-oiled machines. A seasoned professional (20+ years working in restaurants from Germany to New Zealand and beyond), the chef abides by one simple rule: Don’t overcomplicate things and be true to what you serve. Chef Rudolf takes pride in his menus and makes a tremendous effort to pick the best produce, whether that means meeting with local suppliers or traveling a bit further to find the crème de la crème! And when it comes to his staff, he also looks for the best in the market – with the best attitude. Skills, after all, are something that can be taught (although they are certainly desired and required for senior positions). From the Lexington Grill’s Chef De Cuisine Lij Heron (Lij – Pro Chef Awards – Meat Chef of the Year 2014 and 2015) down to the line cooks, you can see that everyone holds a great deal of pride in the work that they do and much respect for Chef Rudolf. Awesome background music accompanied the great wine list and food offerings. Our Arabic mezze and two wraps left us absolutely stuffed. The only thing that disappointed is the surprising lack of thought in the outdoor space; it felt cold and as if Azure was a mere afterthought. The simple addition of yuccas and foliage could easily add warmth and turn it into a tranquil oasis. Afterwards, we got some much-needed R&R by the pool (we entertained the idea of doing some water sports, tennis, or perhaps a desert trek. However, the idea of moving away from our oasis bubble just didn’t appeal) before heading to the Azure beach bar for a sundowner. It was a tough choice but we decided on UMI for dinner. The chain curtains, dark tones, and talented chef in the open Japanese kitchen reminded me of Hakkasan and I was initially very impressed. BUT, after having experienced superb service at Azure earlier, I was disappointed in what was slightly shabby service that didn’t match the luxury environment. Just to make sure I wasn’t overreacting, I did a quick table count and saw that they weren’t even at half capacity which left me wondering why I had to wave twice to get noticed? And why bring a beautiful ice cold Zwiesel glass if you’re not going to bring the actual wine for another 10 minutes? The food itself was pleasant. Our order of dim sum was amazing. The crab salad lacked flavor but the teriyaki chicken swooped in to save the day. Unfortunately, the music was barely audible, making the space feel like a dark, echo-y cavern. Perhaps if they separated the bar from the dining area and added more curtains, it would make the restaurant feel more mysterious and cozy. In this sense, the Waldorf Astoria could be its own best friend or worst enemy. Because we had been SO spoiled all day, our experience with the service and ambience proved to be a bit anticlimactic. Did it ruin our night? No, but it DID ignite a few sighs of disappointment. The next day, we sauntered down to the light and lovely Qasr al Bahar restaurant for a breakfast fit for royalty. The interior here is like being on the shoreline of the sea—soothing pale creams and watery ocean hues fill the space and create a warm and welcome atmosphere for a leisurely meal. After we’d had our fill here, I headed off on my own to another blissful experience. Designed by The Gallery, an HBA company, this spa includes 12 treatment rooms (split evenly between men and women) and it’s clear that no corners were cut in terms of design. With a calming underwater theme, I unwound in a clean and luxurious relaxation room before moving into a glorious treatment room for my Voya full body massage. This light-filled room looked out onto a lush garden – it was like being massaged in a cabana but without being outside. And before you panic, don’t worry — the gardeners and grounds staff can’t see in!! My highly attentive therapist made the whole experience first class. Headed up by the capable and experienced Carere Kwan (who has worked at the spas in the St. Regis Sanya Resort and InterContinental Sanya Resort, to name a few), the spa offers various treatments, including the Cleansing Tides Facial (to reduce the signs of stress effects) and the Oceanic Stones Massage (where you’ll be pampered with seaweed oils and experience the healing properties of hot stones). With beautifully polite staff, the spa also offers manicures and employs some of the best products in my eyes, including QMS Medicosmetics and Voya (which uses hand-harvested seaweed for its powerful purifying qualities), making the whole experience top notch. Couples should try the Couples Journey in the VIP treatment suite and soak in the opulence. A trip to this spa is an absolute must if you’re visiting the hotel. In fact, I’d say that it’s one of the best I’ve been to in a long time! All in all, this Waldorf Astoria was a true delight. Andre stated that Ras Al Khaimah appeals to a varied audience, including local Emirati and expats wanting to escape the busy city life. The hotel has hit a sweet spot within the European market, attracting British and German travellers, as well as tourists from Russia and surrounding countries. In fact, within the first year of opening, it helped increase RAK tourism by 60%. And then, of course, there is the easy accessibility (Qatar Airways offers direct flights to RAK, plus you can drive or come in by helicopter and land on one of the three helipads…as one does). All in all, the Waldorf Astoria Ras Al Khaimah was a true delight, especially since it is the UAE’s first Waldorf Astoria, and Hilton Worldwide’s first luxury property in the UAE! It will dent your bank account, but you’ll be too blissed out to moan about it!